Hey Guys today we are talking about all new Battle Royal Apex Legends available on Xbox one, PS4, Origin on PC. We will tell you every thing you need to know about this game. Nowadays there are so many battle royals available for Every Consoles as well as for Mobiles, If you are a mobile Gamer then this game is not for you but if we consider console gamer we have certain advantages as well as disadvantages for opting Apex Legends. But main point is that this game is available for free. Apex Legends consist of three man squad landing in a battle field of 60 plays i.e. 20 squads, fighting for victory. There are three rounds in each game teammates can be revived and also they can be re-spawned if one of the player in a team is alive and got his team mate player card from his loot crate, there are certain loot crates available when you land at any spot in the map. There are around 8 legends to select whenever you play each and every time you will get chance to select a legend which you want to be in that round, every legend has got its own special power which can be used at the time of survival. There are all kind of weapons pistols, shotguns to sniper and smg to rifles. If you're going to survive the Apex Games, you gave to think fast. Master your Legend's abilities, make strategic calls on the fly, and use your team strengths to your advantage in vicious 60- player matches. Experience the next evolution of battle royale with Re-spawn beacons you can use to resurrect your teammates, smart commands to help you communicate, intelligent inventory so you can grab only what you need, and all new way to drop into action with Jump master deployment. If you really want to play Apex Legends the way it was intended to be played, you'll want to have a rig that looks a little bit more like this. Obviously the more you're packing under the hood, the better all areas of the game will perform. 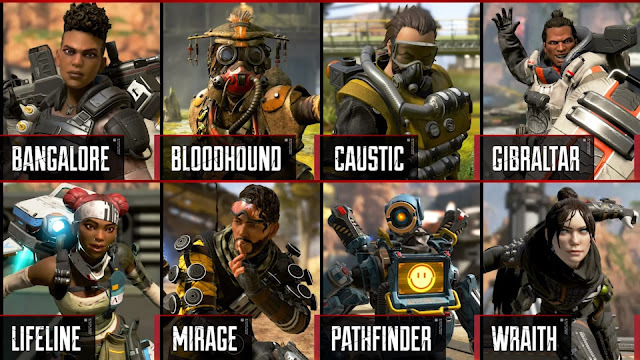 What makes Apex Legends Different ? Here comes the main question that what makes Apex Legends Different from other Battle Royal, apex legends is available for free on all consoles, available for three man squad for now, unique legends special power, no fall damage, only three rounds. Watch This Gameplay and share this post. Let us know more about it in comment section below.